Psst. Don’t mention the wine. The Chancellor of the Exchequer, George Osborne, didn’t say the word once in his UK Budget speech yesterday, on 23rd March. He simply said that there would be no further increases to alcohol duty beyond the measures already in place. The media relayed the apparent good news as ‘no increase in alcohol tax’ but a few tweets later and a quick glance at the HM Treasury budget statement (page 61) showed that wine has gone up 15p a bottle, from this Sunday. Even a 4p annual increase used to get mentioned in every Budget overview. Now, a 15p rise doesn’t even get a look in. So, forgive me, but this calls for a rant. So we now have a situation where none of the three major parties will criticize the policy towards alcohol duty. 1. 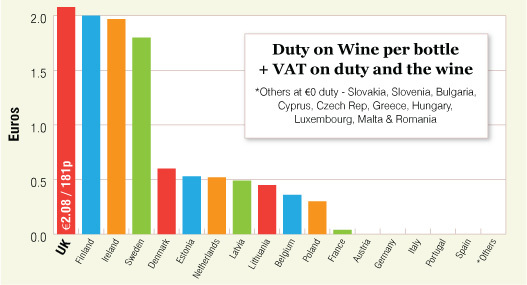 The UK now has the highest duty on wine in Europe. 2. Only four countries (UK, Ireland, Finland and Sweden) have duty of over 50p a bottle. In France, it’s 3p. 3. From April 2000, our first spring here, to March 2008, UK duty on wine went up by a total of 15%. In the last three years, duty has gone up a whopping 36%. 4. Duty will increase by 2% above inflation each year until 2015. It went up 7.2% in this budget from £1.69 to £1.81. It is misleading though to say that wine has gone up 12p + VAT to the consumer, because every retailer, merchant and restaurant treats duty as part of the cost, just like the wine. Duty is charged upfront by HMRC, when the wine is taken out of customs, so it’s a real cost. Every merchant I know, except of course those that are selling ‘In Bond’, takes the cost of wine, plus the cost of freight/distribution and the duty as the basis of the cost of the wine, before adding their gross margin to cover their costs and to make a profit. 6. 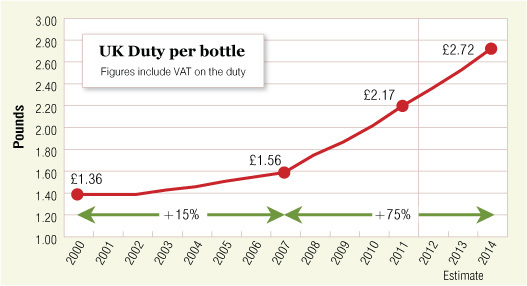 On sparkling wine or Champagne, duty is more at over £33 a case and by 2014, it’s likely to be £41 a case. It’s worth noting that GB is the biggest export market for Champagne. 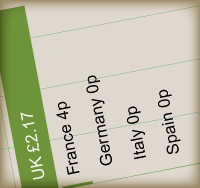 £40 more for a case in the UK than in France? This rate also applies to the increasingly successful sparkling wines from England. 7. 53% of a £5 bottle of wine today is tax, as is £3 on a £7 bottle, give or take 2p. 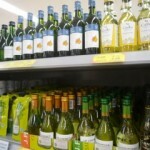 The average retail spend is just £4.47 a bottle (57% tax now). @Timatkin 12p/bottle hike – scandalous. Add in 5%+ inflation and we’re looking at even crappier wine for supermkts to hit lower price points. 9. £9 retail (from a shop or a merchant) is the starting price at which a bottle might cost the same as the tax – around £3.30, assuming no tricks to con the consumer. Shipping, warehousing, distribution, admin, operating margin and a slim profit fills the bit in the middle. 10. Spend £5 on a bottle retail, and the cost of the wine from source is under £1. Spend £10 and the cost price of the wine goes up fourfold, assuming similar shipping costs and % margin. Not that £10 for a four quid wine is a particularly good deal, in my opinion. 11. The trouble is, how do you know if a £10 wine in a supermarket isn’t being set up for a ‘50% off’ deal, meaning it should really be £5 anyway? It’s standard practice now to ‘list’ a wine for £10 and then stick it on promotion at ‘50% off’ – no surprise, given that the bulk wine that went into it costs a euro a litre. Anyone pay a tenner? You were done. Sorry. 13. On the last point, I’ve assumed that the restaurant is buying, ahem, through a merchant, of course. Restaurants generally buy ‘DPD’ or ‘duty paid delivered’ prices, so they don’t normally see the true breakdown. The cost of duty, which is often higher than the wine, has a huge impact on the price of cheaper wines on the list. If that’s the case, as No 12 above, does the old adage of ‘always buy the house wine’ still hold true? At least with our stuff, you know your money’s coming to the producer. And to George, obviously. Thanks for that interesting insight into how we are being ripped off! I’ve been buying most my every day drinkers [< €10] from France for a number of years now. Either from good merchants in Northern France, or ideally direct from interesting producers whilst on holiday. Maybe we’ll see a resurgence of the ‘booze cruise’ again? Thanks for the comment, Alan. Not sure about the booze cruise again – but I do think that people will have better options in the future. Just not in the current format. Sort of what you do but in a more easily accessible way. Really thought-provoking piece. It does however show that it's not just the latest rise in UK duty that has created this extreme of difference between ex-cellar and retail price. It's been going on for some time – just worse now. HMRC figures show that despite depressed sales in part generated by extra taxation, the Treasury is still raking in extra funds from the drinks sector every year. For instance, since 2000, wine sales volumes have increased by 9% but the tax take has soared by 74%. Hi Gavin – excellent piece on the detail behind duty on wine. We have been looking at this for a while and we analysed the HMRC data which was reported in The Drinks Business (see press release http://ymlp.com/zXFCDG). We have also just launched a new WDR calculator on our website that allows you calculate the total duty + VAT on any size of alcoholic drink (http://www.wilson-drinks-report.com/duty-vat-calculator). Thanks, Tim, I'll take a look. great post – lots of stuff that people need to know. The problem is, there are those among us who have been saying this for a while, yet nothing changes. How do we get people to understand the personal as well as commercial implications of this? Very interesting and increasingly frustrating for the UK booze trade generally. As a huge supporter of English wine and the efforts of vineyards here to produce a high quality often award-winning product – this does not help their lot. Producers in France and Germany are not taxed to the extent British wine producers are, the cost of land is also generally cheaper – yet British producers pay as much duty on wine produced here as that levied on wines from other countries. This rise by stealth will hit UK producers hard and add to the head-scratching around what a 'budget for growth' and 'support of small businesses' means, and make the business of competing in the UK market with a UK produced quality product more challenging. An old sage once said to me years ago that it was always worth spending a bit more on a bottle of wine than you might otherwise because, on cheaper wines, you can be paying as much for the bottle as its contents. Even truer now, as your analysis highlights. If only the £60bn or so that it is said that HMRC loses each year from intricate tax avoidance schemes was successfully gathered then we could all drink more cheaply. Maybe a drinkers' campaign against tax avoidance would gain the Chancellor's gratitude? Fascinating, thanks very much. As a new importer its a slightly galling prospect. The 2% Duty Escalator established by the previous government is going to have some serious repercussions given that inflation looks set to increase for the forseeable. I'm just about to get married and we're providing all the wine and champagne for our 120 guests. I've just realised how much I'll be paying in duty, and how much I'll have had to earn to buy all that wine (i.e. 22% more).